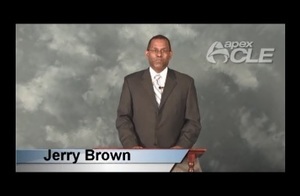 Jerry Brown is an associate at Foley & Lardner LLP. His experience includes representing investor-owned gas and electric utilities before the ICC in connection with rate cases, service classification, securing approval of affiliated interest contracts for coal transloading services, and securing approval for issuances. He is a member of the firm's Energy Industry Team and Business Litigation & Dispute Resolution Practice. Mr. Brown's litigation experience includes representing clients in actions for mortgage foreclosure, forcible entry and detainer, mechanics lien, condemnation, partition, check fraud, personal injury, housing discrimination, RICO, declaratory judgment, breach of contract, bankruptcy adversary proceedings, and criminal matters.